Up to ø 3.15 in. Bar machining Max. turning diameter up to ø 14.4 in* *For OD tool with 1.4 in. 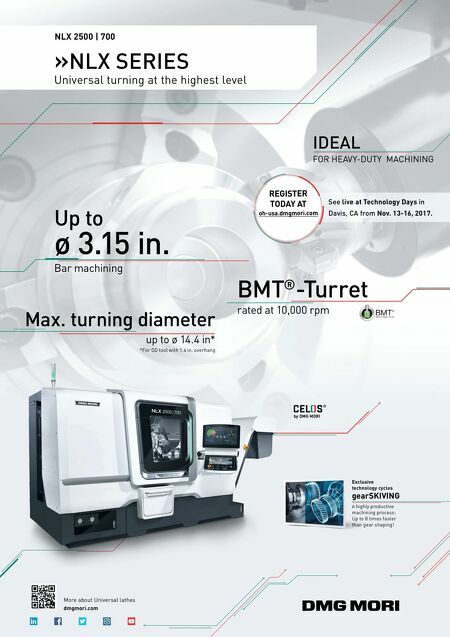 overhang BMT ® -Turret rated at 10,000 rpm by DMG MORI Exclusive technology cycles gearSKIVING A highly productive machining process: Up to 8 times faster than gear shaping! NLX 2500 | 700 »NLX SERIES Universal turning at the highest level IDEAL FOR HEAVY-DUTY MACHINING More about Universal lathes dmgmori.com REGISTER TODAY AT oh-usa.dmgmori.com See live at Technology Days in Davis, CA from Nov. 13-16, 2017.